Jab, Cross, Hook Combinations – Damien Trainor’s Boxing for Kickboxing Training – Multiple world champion and renown Kickboxing & Muay Thai coach, Damien Trainor, demonstrates (whilst training at K-Star Legacy Gym in Birmingham) some good old jab, cross, hook combinations that won’t disappoint you when practising your boxing for kickboxing technical skills. Support K1ANOOP via Patreon from £1/month to produce more films about Kickboxing and Muay Thai fighters. Damien Trainor is a modern day coaching pioneer for MMA Striking, Kickboxing & Muay Thai and is a much sought after coach around the world by elite fighters in: GLORY Kickboxing, Lion Fight, Bellator Kickboxing, Bellator MMA, Cage Warriors, BAMMA and the UFC including, UFC Flyweight Champion, Henry Cejudo. With thanks to: Damien Trainor (Instagram @trainor103) and K-Star Legacy Gym. [2:15] Lessons learnt since the K-1 days by GLORY Kickboxing? [2:50] Does Rico Verhoeven beat Anthony Joshua? Keep up-to-date with all the latest in Kickboxing and Muay Thai, plus, exclusive interviews by subscribing to the K1ANOOP YouTube channel and “like” K1ANOOP on Facebook too. ONE Championship have set-up their own Kickboxing organisation and have announced singing multiple world champions: Giorgio Petrosyan, Fabio Pinca & Regian Eersel; and are set to feature in some capacity on, the ONE Championship Kickboxing promotional debut in Manilla on April 20, 2018 at the ONE: Heroes of Honour event. The news was broken overnight by ABS-CBN News including, the signings of both Yodsanklai Fairtex and Sam-A Gaiyanghadao for ONE Championship Kickboxing too. Giorgio Petrosyan will make his promotional debut on the ONE: Hero of Honour card in Manilla against another Lion Fight world champion (in-addition to Eersel’s ONE debut) in, Jo Nattuwat who, was born in Thailand, but living in the USA whilst fighting for Lion Fight. However, with ONE Championship Kickboxing signing the likes of, “The Doctor” along with Fabio Pinca & “The Immortal” Regian Eersel, more fuel will undoubtedly be poured on the fires of speculation over the uncertain futures of all three men in the world of Kickboxing and Muay Thai. It is understood that the contracts for the above three are not exclusively binding to ONE Championship Kickboxing and allow for either of them to pursue MMA careers via ONE Championship. Both Pinca & Eersel have made it no secret that they have been training for quite some time in the grappling arts and are open to fighting MMA in the near future. Since 2012, Muay Thai legend, John Wayne Parr, who currently fights for Bellator Kickboxing, has been promoting Muay Thai fights in a cage under his own promotion, Caged Muay Thai (CMT) in Australia which, has grown in popularity. CMT has regularly featured international fighters, despite some Thaiboxing purists accusing the living legend of, “bastardising” the sport. However, five and a half years on, “The Gunslinger” has become quite the influencing pioneer for the striking arts being showcased in a cage and not in a traditional boxing ring. However, despite the exciting news about the launch of ONE Championship Kickboxing, the promotion’s MMA ventures haven’t always been smooth sailing since their inauguration in 2011, especially when dealing with fighters from the western world. For example, the promotion’s well publicised fall-outs with both James McSweeney and heavyweight rival, Chi Lewis-Parry who, were both previously signed to, ONE Fighting Championship and were being lined-up to fight each other; only for both fighters to be controversially released by the promotion after both men dramatically fell out with ONE Championship (at different points in time) over a variety of allegations including, mistreatment. Nevertheless, the marquee signing of two-time K-1 World Grand Prix champion, Giorgio Petrosyan, is undoubtedly the biggest name in western combat sports to join ONE Championship following on from, former UFC heavyweight, Brandon Vera, in July 2014. Since then the promotion have obviously hit some turbulent times (like many others including, GLORY Kickboxing) but now seem to have restrategised themselves from a much wider business marketing perspective, embarking on a more positive direction and signalling their serious intentions for future growth, in both MMA and world kickboxing. K1ANOOP will report again on further developments as more fighters from both Europe and the UK are expected to confirm signing for ONE Championship Kickboxing. “Like” K1ANOOP on Facebook & Subscribe on YouTube for more independent and insightful Kickboxing & MMA coverage, news, interviews and mini documentaries. Martijn de Jong is a former Dutch MMA fighter who, would become one of the pioneers of Dutch kickboxing and mixed martial arts. Over the decades, Martijn was heavily involved with the legendary Golden Glory Gym; and, was one of the original co-founders of, GLORY Kickboxing. Now head coach of Tatsujin MMA with gyms in the Netherlands, Indonesia and Malaysia, de Jong is now managing and coaching various international fighters in major promotions such as: ONE Championship and the UFC. Former GLORY Kickboxing light-heavyweight champion, Gökhan Saki, is currently managed by, Martijn de Jong who, orchestrated Saki signing for the UFC earlier this year; and is set to make his UFC debut at UFC Fight Night Japan on September 23, 2017. The K1Anoop Show is available on iTunes, TuneIn, Overcast, Player FM and Podbean | Watch each and every episode on YouTube | New episodes every Tuesday, Thursday & Saturdays. Saki is one of many legendary fighters including the likes of: Alistair Overeem, Valentijn Overeem and former women’s Strikeforce champion, Marloes Coenen that have all been coached, and or, managed by, Martijn de Jong during their careers, or, whilst fighting out of Golden Glory in the Netherlands. On this episode of The K1Anoop Show with Martijn de Jong, we cover some of the historic moments in the sport of MMA and kickboxing involving, the above named fighters. As well as the past, present and future of GLORY Kickboxing, Gokhan Saki’s forthcoming UFC debut and de Jong’s vast knowledge and experiences in the world of combat sports and martial arts. Photo credit: Featured image via Martijn de Jong on Facebook. Kevin Ross and Gina Carano guest on The K1Anoop Show following on from the recent announcement that Ross will be fighting, Domenico Lomurno, for Bellator Kickboxing’s inaugural featherweight title at, Bellator Kickboxing 7 on September 23, 2017. And plenty of more talking points too. Kevin Ross vs. Domenico Lomurno will take place on September 23, 2017 at the SAP Center, San Jose on the Bellator Kickboxing 7 (Bellator KB 7) fight card as reported by Liverkick. “The Soul Assassin” will finally be fighting for Bellator Kickboxing‘s vacant featherweight title, having been expecting a title-fight on June 17 in Rome as he’d discussed on The K1Anoop Show. 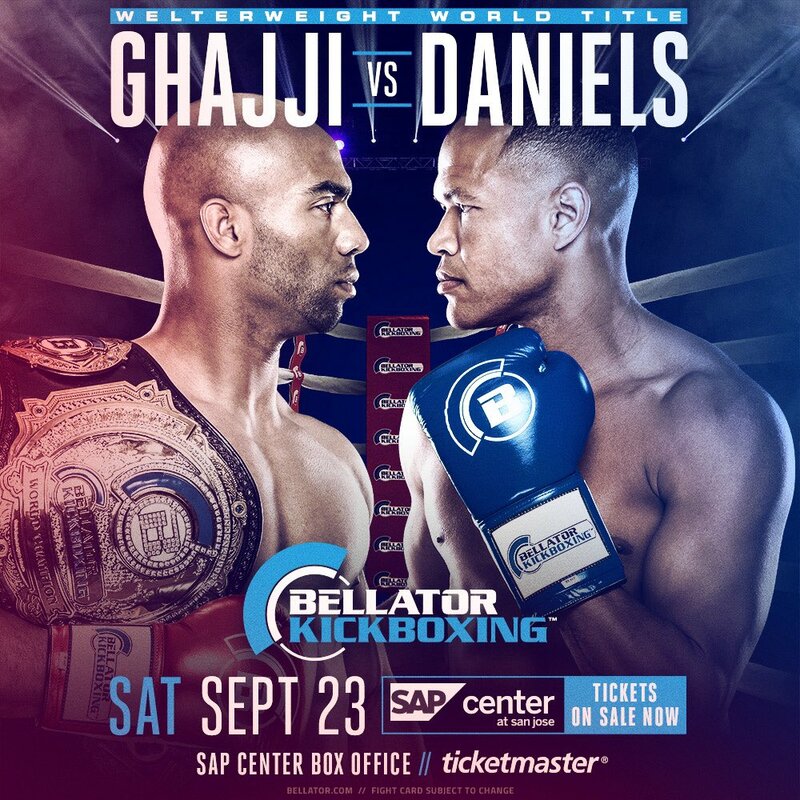 The news follows on from Bellator’s initial announcement of Bellator KB 7 and Bellator 183 in June that Karim Ghajji vs. Raymond Daniels will also be featuring on the September event. Ghajji will be defending his Bellator KB welterweight title against Daniels, both of whom had fought for GLORY Kickboxing in previous years. Kickboxing and MMA fighter, Paul Daley, will also feature on the joint event but in a MMA bout on the Bellator 183 fight card against, Lorenz Larkin. K1ANOOP will report again as the Bellator KB 7 fight card gets updated in due course. Tiffany van Soest and Denise Kielholtz are both world champion kickboxers for GLORY Kickboxing and Bellator Kickboxing, respectively and had previously clashed with one another in the past. Of the two champions, the next to defend their title will be van Soest on August 25, 2017 against Funda Alkayiş at GLORY 44 SuperFight Series, New York. Whilst Kielholtz is planning a return to the ring, and or, cage in the second half of this year. So, in the spirit of ‘Throwback Thursday’, let’s relive an intense showdown of ringcraft and skill betweeen two of the very best female fighters in world kickboxing; and who knows, these two could possibly rematch one another in kickboxing or MMA. Following his emphatic, second round head kick KO of, Nando Calzetta at, Bellator Kickboxing 5 on April 8, 2017 in Italy; John Wayne Parr joins #TheK1AnoopShow and looks ahead at what the coming months will have in-store for him with both, his own fighting promotion, Caged Muay Thai (in Australia), his future fighting career at Bellator Kickboxing and much more. Gabriel Varga is a former GLORY Kickboxing champion who, recently made his Bellator Kickboxing debut at, Bellator Kickboxing 6 against, Gabor Gorbic on April 14, 2017 in Budapest. However, Varga would end-up losing a controversial split-decision to Gorbic, leading to a mass outcry from many pros and fans at the shocking decision loss. The result was obviously at the centre of this episode of #TheK1AnoopShow as we caught up with Gabriel and recapped his Bellator Kickboxing debut. As well as how and why he feels aggrieved and most significantly, what measures can and should be taken going forward, to prevent such flaws in the system of officiating kickboxing. John Wayne Parr​ (JWP) is an Australian Muay Thai fighter and professional kickboxer who, made his Bellator Kickboxing​ debut at Bellator Kickboxing 5 on, April 8, 2017 against Nando Calzetta in Italy (with a second round, high kick KO win)​. JWP joins #TheK1AnoopShow prior-to making his Bellator debut in Italy and has fought for K-1 in Japan during the ‘Golden era’ of kickboxing. As well as being widely considered across the world as most probably, the greatest Muay Farang alive and actively fighting.